The Earth's ozone layer is a low-density band of ozone (o3 or Trioxygen) in the stratosphere, which is 10-50 km above the earth's surface. 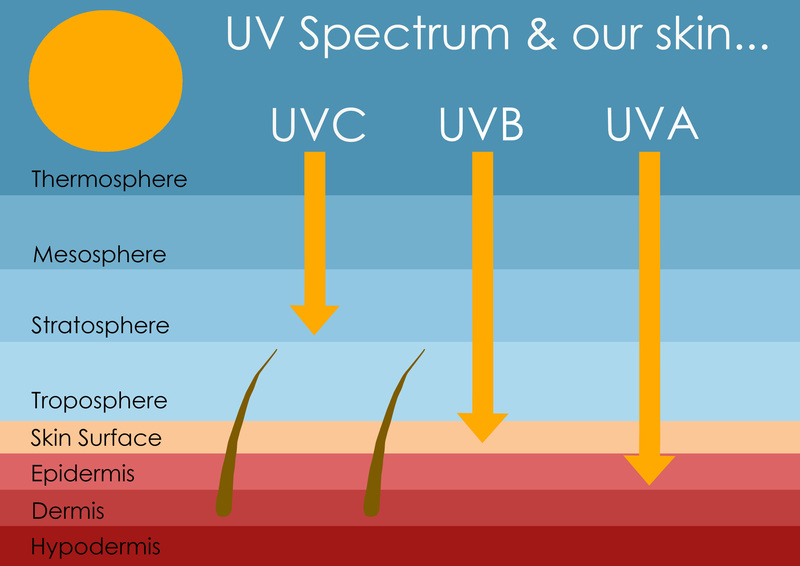 The ozone filters out all the UVC light and most of the UVB light, but none of the UVA light. Actually, 98.7% of all UV radiation that reaches the earth's land and water surfaces are UVA light rays. It is therefore vitally important that the sunscreen you use protects you from the sun's UVA rays, and not only the UVB rays. Preferably a high level of protection compared to the UVB level. 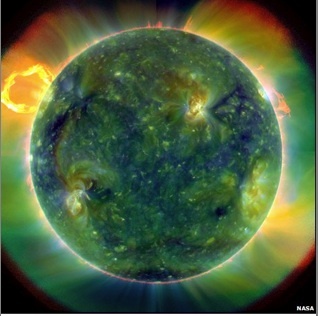 Ultraviolet light rays, as rays of energy coming from the sun, are invisible to the human eye. If not sufficiently protected while being exposed, or overexposed, these rays can cause considerable burn damage to our eyes, hair, and skin. They can cause chemical changes in the body that suppress the body's immune system and stimulate the growth of cancer cells by generating toxic substances known as free radicals. These free radicals, which attack and damage our DNA, contribute towards skin cancer. However, there are certain molecules in vitamin-rich foods, or antioxidants, that absorb these free radicals and prevent any further damage. Choosing a sunscreen that contains antioxidants as well as sun protective ingredients means that you get protection as well as healing qualities. While the sun provides us with wonderful life-giving energy, it is very important to understand the extent of the light rays role in our overall functioning. Of increasing importance the more we learn about it, is the fact that absorbing UVB rays through our skin enables our bodies to make Vitamin D. This strengthens our bones and teeth and assists our bodies in building immunities to such diseases as Rickets and many cancers. UV rays are also used to treat Psoriasis. By exposing the affected skin to these rays, it will slow the growth of the skin cells, preventing an outbreak of the itchy patches for which psoriasis is known. In addition to this, these rays have various commercial uses including sterilization and disinfection. The animal and plant kingdom. Ultra violet rays are used for a multitude of purposes, many of which we haven't begun to understand. Plants photosynthesize and some animals appear to have the ability to see ultra violet rays and UV vision helps bees to collect pollen from flowers. However, one thing everyone is agreed on is that too much exposure to the sun has the ability to cause sunburn. If the skin absorbs too much of the sun's energy from the light rays, it turns red, hot, may sting on contact and feel generally very uncomfortable. Essentially, sunburnt skin alerts our blood to rush to the sunburnt area to cool the damaged skin, after which the damaged, dead skin will be able to peel away. However, this may have caused DNA damage that in turn, through time, leads to skin cancer. Darker skinned people may not burn that easily, but are equally as susceptible as fairer skinned peoples' skin is to the damage caused by over exposure to the sun's rays. ie. You don't necessarily have to have had a sunburn to start the DNA damage process that ends up in skin cancer! Ultra violet ray damage caused to eyes is initially a pain or temporary blindness and blurred vision. Over time, however, ultra violet ray damage will ultimately result in the growth of cataracts on the eyes. UV protective sunglasses also help to protect the eyes. What many people don't think of is their hair. 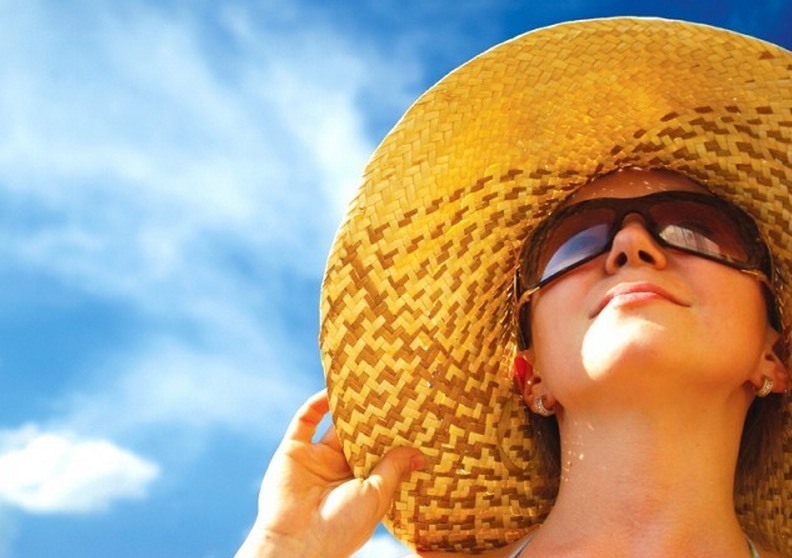 Just by wearing a hat, you protect your hair from UV damage. Besides clothing, the next best option is a sunscreen with a physical block as the UV protection ingredient - either zinc oxide or titanium dioxide - as these provide protection from both UVA and UVB rays. A good habit, especially if fair skinned, is to wear a sunscreen every day that you are going to be exposed to the sun. 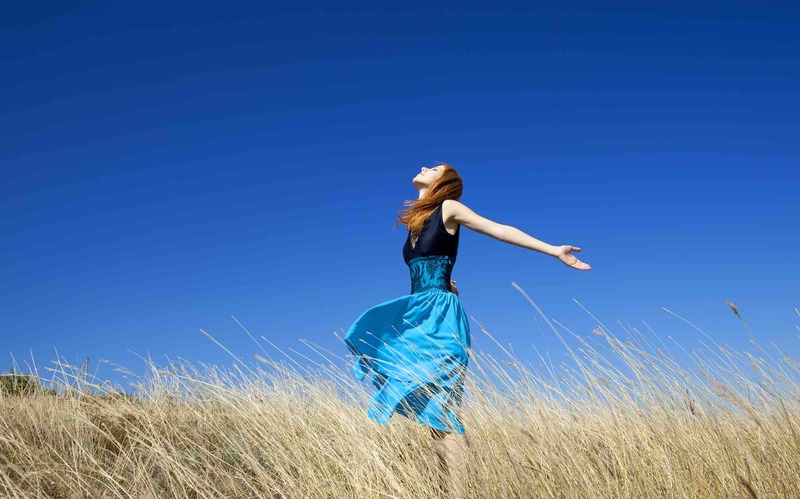 If anticipating long exposure to the sun, cover up, use sunscreen and enjoy the sunshine for all it's positive benefits!